And now for something completely different! Art nouveau, Art Deco, plushy psychedelics, Steiner’s Goetheanum Hogwarts-ey vibe: step through the cinema entrance on busy downtown street and you’re in different times. A sumptuous shrine to the golden age of cinema, commissioned by the eponymous Polish-born taylor in 1921 (architect Hijman Louis de Jong). My treat would be to pop some LSD, sink in one of the comfy velvet sofas in the lobby and just stare at the incredibly lavish carpet, wall and ceiling patterns for good couple of hours. But you can also go see a movie. Or take an audio tour of the building, every morning. Your call. Beautiful building filled with light and the best of contemporary photography. Nuff said. 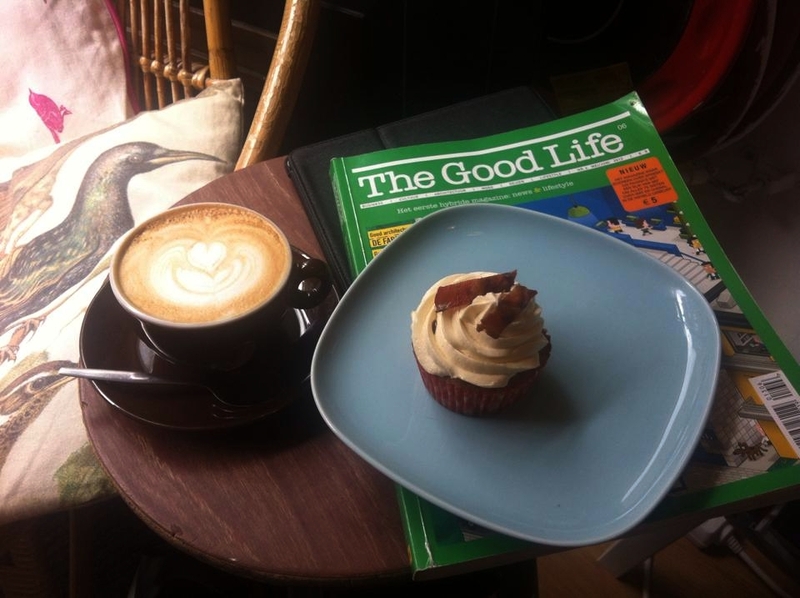 Tiny coffee shop and roastery with improbably decadent sweets (pictured above: double-bacon peanut butter cupcake) is the perfect plan on the way to / from Foam. Or to Melkweg, busy cultural hub nested in the beautiful brick building of former sugar/milk factory nearby. Yes, the Amsterdam Dance Event makes the city even fuller of people and hotel prices soar even higher. But it’s such a treat to see how - supported by the city government - this 5-day mid-October music festival and conference paints the city yellow and fills it with the creme de la creme of all electronic genres, celebrating the rave culture. Beautiful statement of the importance of electronic music in Dutch culture and Amsterdam life - pick your vice in their extensive schedule of clubs, museums, cinemas, warehouses or other pop-up spaces and go. No more a secret but still worth playing the speakeasy game. This small, well-regarded prohibition-style bar is just coupla steps from the aforementioned Tuschinski - hence a well recommended liquid extension of this 1920’s voyage. The menu is playful, staff sweet, cocktails expert and well served, décor dim as should be - true professionals. Be one yourself and book in advance. Running through the hip Jordaan district, this street is a beautiful shopping / dining / leisure area. Just take a casual stroll west-bound from the busy Centraal, lick some local designer’s shopping windows (lot of eye candy everywhere), stop by The Movies cinema, cute art deco movie theater with good bar, or choose one of many restaurants along. You can also finish in the soothing Westerpark and Gashouder area, greeted by its wonderful red-brick industrial architecture and multitude of good restaurants and other passtimes. We chose the Troost brewery for its no-brainer combination of good burgers and 10+ on-site brewed beers, but maybe you prefer sth else; such as petting dwarf goats, clubbing in the former gasholder with 3500 other people (home of the famous Awakenings club events) or contemplating the neighbouring community gardens.